Today, Google is the most popular search engine in the world, but it wasn’t in the too distant past that Google was just one of the many search engines available on the nascent web battling for mind share. During those early days of the Internet, Google differentiated itself by sticking to it’s academic routes and followed logical algorithms predicated on library science to rank their results. A carryover from its academic roots is the ability to conduct an advanced search on Google which allows users to narrow down a search query by many different attributes. Most of these advanced queries are of little use to the average user since it would require understanding how these queries work. In his book, Google Power Search – The Essential Guide to Finding Anything Online With Google, Stephan Spencer has created the quintessential guide as to how to unlock the power of these advanced query tools. In reading this book, I learned a great deal on how I could use Google advanced queries to find just the right piece of content I was looking for. If I were searching for a particular article that covered a certain topic, was written in a specific set of years, and should not be on a precise website that I declared, there is an advanced query for this task. As an example, say you once read an article about a technology called cryptocurrency long before it became popular. You think it might have been in in 2015 or 2016, the site was a college (.edu) and it was likely an ivy league school. An advanced query could quickly find all the possible results for this whereas a traditional query would have you searching all day. Throughout the pages of this book, it is abundantly clear that Stephan Spencer is an absolute expert in how search engines work and the corresponding efforts to help websites improve their visibility in Google. The message that comes across is advanced queries help counteract poor SEO that would otherwise make it very hard to find the results you are looking for. A page that might be ranked at #200 in the search results, can show up at #1 if a query is built that will surface just that page. Once every advanced query is fully fleshed out, Google Power Search shares tools that might help a user understand what others are searching for like UberSuggest and Soovle. Most of them I had seen before but I was pleasantly surprised to learn about Google Feud which is a game that tests Google knowledge on current events. The book closes out with some truly geeky advanced query string parameters to add to Google queries which allow users to filter for specific languages, dates and result types without needing to open up the Google advanced search query options. Google Power Search is the Swiss army knife for all Google users, and you should never have to give up searching for something online that you know is there. Whether you have been using Google for 2 years or all throughout Google’s nearly 2 decades, this book is a must read. 97% of people use search every single day and knowing how to search better will add hours back into your life. 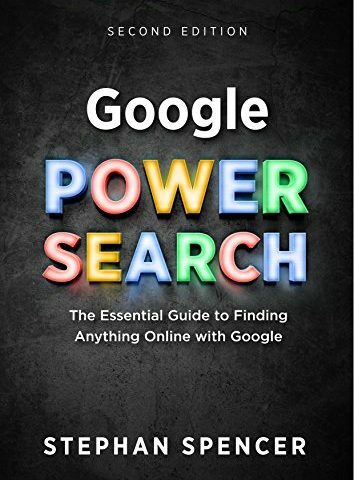 Check out the official Power Search website and buy the audiobook or book now and prepare to have your Google skills expanded! Next Post:What is an SEO site audit and do you need one?